Isand Song won the 2008 Qbliss Magazine Excellence in Literature Award! Blurb: After the death of his lover, Garrett Davidson finds himself sitting in a Hawaiian beach shack, staring at the vast unfathomable pacific. He has nothing left. Despair has robbed him of his elegant home, lucrative job, friends, and his sanity. The single thread holding him to reality is the story he has come there to write, Marc's story; the story of his lost love. Then Songoree walks into his life. When Songoree, a local surfer, attempts to heal Garrett's wounded spirit, they become entwined in an extraordinary and dangerous relationship. But the stakes are raised when Songoree's grandfather, a venerable Kahuna, uses his ancient shaman methods to attack Garrett in order to fulfill his own aspirations. A clash of wills erupts between grandfather and grandson with Garrett caught in the middle, driving the plot to an unexpected ending that will brutally test the human spirit . . . but not break it! The story's focus shifts to Garret Davidson. Two years after the AIDS related death of his lover in San Francisco , Davidson comes to Hawaii to write a book about his lost love. He wants only to be alone in the beach shack he has rented, to stare out at the endless ocean and heal his wounded spirit. Alan Chin has penned an uplifting read that transports one not only to Hawaii , but ultimately and far more importantly to the island that lies within, the island of the heart. What the author would have us understand is that it is on this island where the wounded and the unhappy—and isn't that at one time or another each of us—will find the healing, the peace, they seek. This is its song. It's been two years since the death of Garrett Davidson's lover, but for Garrett, the pain is still just as fresh as if it had been only yesterday. His pain is so overwhelming he feels he won't be able to move on until he's exorcised his lost lover from his life. He'll do that by keeping his promise to write their story. Garrett quits his successful job in San Francisco , packs up, and indefinitely rents a secluded beach house in a small Hawaiian town. The house comes with its own caretaker, a handsome young islander named Songoree. Songoree's grandfather is the local shaman, a revered and feared figure in the village. He's been training Song to take over for him, teaching him to carry on his vision of a world living in peace instead of war. Grandfather is convinced that Garrett is the Chosen One he has been promised, but Song isn't so sure. Still, there's something about the man that intrigues Songoree. Much to his surprise, Garrett is finding himself attracted to Songoree as well. As the two face their growing attraction, they must also face the disapproval of the conservative islanders, as well the expectations of Song's grandfather. 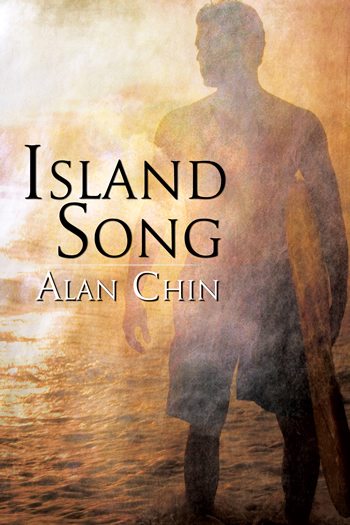 Island Song is a beautiful novel. Technically, this book would probably be categorized as a romance novel, but it's really so much more. Island Song is about loss, healing, finding love in unexpected places, leaving the world a better place when we're gone... and the sacrifices we sometimes have to make to achieve that. First-time-author Alan Chin writes characters that are richly drawn. Garrett's pain is revealed slowly through flashbacks and dreams. He's a broken man haunted by the love of his life, but he has to let go in order to move on. Songoree is a sensitive, sweet soul. While he doesn't quite fit in with his rough-and-tumble surfer buddies, he's accepted as one of the gang as long as he sticks to the straight and narrow. Even the secondary characters are vivid: Grandfather, Audrey, Mother Kamamalu, Hap. Each stands on their own as fully realized personalities, adding depth and dimension to an already strong story. Just as important as the human characters is the island upon which the story is set, Hawaii . While Chin does a fantastic job of recreating the lush, exotic feel of the island, he goes beyond a mere travelogue and really captures the spirit of the island. The book is written in the present tense, an unusual approach these days. It took me a while to get into the rhythm, but once I did, the style really works. It creates a sense of urgency and immediacy that serves the story well. I was completely enchanted by this novel, and I look forward to more from Alan Chin. A FULL MOON RISES FROM THE SEA. Strands of silver light reach across the vast Pacific, caressing an old man’s face as he sits in the bow of an outrigger canoe. The old man studies the moon until it hovers well above the horizon, a radiant beacon lighting the way. He lifts his left arm and signals to move ahead. Songoree, the young man in the stern, digs his paddle into the dark water, driving the canoe through the channel and beyond the mouth of Neue Bay. A fresh wind drifts over the bay from the northeast. It whispers as it moves over the canoe and falls silent as it flows back over the channel. The only other sound is the splash of the paddle gliding in and out of the water. The old man signals to halt. Songoree lifts his paddle, waits. The boat slows and begins to drift with the tide. He watches the old one taste the air, feel the wind caress his cheek, note which direction the boat moves. Songoree’s gaze shifts to the water. He listens. Up ahead, he hears the faint splash of sharks as they pursue their prey. He sees the phosphorescent wakes the night hunters carve through the inky water. Neue Bay is a safe place to swim during the day, he knows, but at night the big sharks, the really dangerous fish, swim over the reef to hunt close to shore. These fish have no fear, but they are feared by everything that swims. The old man smiles. He motions in a direction slightly east of the boat’s heading. Songoree glances over his shoulder to check the position of the dim glow of lights far off the stern. He digs his paddle into the water, makes the adjustment in course. Moonlight silvers the strong lines of Songoree’s bare chest and lean torso. His hair shines blue, and sweeps back over his shoulders, held in place by coconut oil and a wreath made of fragrant maile leaves. A single-strand pink coral necklace hangs around his neck, and a blood-red tapa cloth hugs his body from waist to knees. The dark cloth blends with the shadows in the boat, making it appear as thought Songoree is an extension of the canoe, some bizarre sea creature hunting the perimeter of the reef. Over the wind’s murmur comes a faint sound, a pulse, which announces they are nearing their destination. Songoree sighs. The tedious journey has his arms and back burning. He has kept a fast pace until now, to prove his mettle to the old man, but he knows he can’t maintain his bold tempo much longer. The growing sound of surf renews his hope that his strength will last. This mission, Songoree thinks, is impossible even for an extraordinary man much less for mere islanders like us. But I have no choice and neither does Grandfather. We have stepped onto the path, and our only option now is to take the next step, even though failure is certain. Grandfather has the insane idea that a man with a pure vision, a Gandhi, can change the entire human experience. It’s true that Grandfather is remarkable. He holds knowledge passed down from generations of island shamans, but he is still just one old man—and perhaps a crazy old man, at that. Songoree tries to lift his spirits, reminding himself that the mission will soon be over, that they will perform the ceremony and that will be the end of it. But a stubborn fear lodges in his heart. The weight of it crushes him, making it difficult for him to breathe. It is more than fear of failure. Failing will prove once and for all that his years of training with his grandfather were wasted, that the old man is no great shaman, merely a sham. Songoree shakes the thought from his mind, but the fear remains locked in his heart. He grits his teeth, digs his paddle into the water, leans on it, drives the canoe towards their destination. Songoree paddles another thirty minutes before the sound of breakers boom like thunder. He knows that landing the canoe in huge surf is hazardous even in daylight, and he has never attempted such a feat at night. If they capsize, he will need to pull the old man through the breakers. He comes alert. His fatigue dissolves. Beads of sweat coat his face while his teeth chatter. He fights to maneuver the canoe through the swells and over the fingers of reef clawing at the water’s surface. Suddenly, the boat’s aft rises on a huge wall of water. Now the canoe is almost perpendicular, and Songoree paddles a frenzied pace as they speed toward shore. Water sprays his face. The salty mist blinds him. He maneuvers on instinct alone while the wave, dying around him, rushes towards the sand. He blinks his eyes until his vision returns. The old man sits in the bow, still as a statue. Songoree beaches the craft just below a rocky point that defines the northern crest of the island. As he bounds from the boat he steals a glance at Grandfather’s face, expecting some recognition of his skill, but the old man shows nothing. Hauling the outrigger onto a patch of sand, Songoree takes the old man’s arm. Grandfather strains to a standing position. He pauses for a moment while his body adjusts to movement again after sitting for so long a time. Grandfather has deep-set eyes the color of black coral, and his face is cracked like the glaze on ancient pottery. A feathered cape covers his thin body, its brilliant colors dulled by the dim light. His silver hair falls to the middle of his back. Around the old man’s neck hangs his ceremonial necklace, a simple piece of carved jade bordered by a string of sharks’ teeth—trophies he had ripped from the mouths of his prey in his younger years. Grandfather bends to grab his staff from the canoe. It towers three feet above his head, and carved into the dark wood are faces of the island gods: Kane, Kanalou, Ku, Lono and Pele. The old man’s bloodline reaches back to the first group of Polynesian settlers who discovered this fleet of Pacific islands. His family migrated to this largest and most southern island before even the first of the great wars. They settled near the Paopao River in a valley called Waimanu, a place known for its immense spiritual power. Now the old man has gone far beyond his eightieth year and has outlived Kushi, his wife of forty years, his only son and one of his two daughters. Songoree is now his sole companion and caretaker. Only a few islanders know the old man’s true name, and no one but Songoree knows his spiritual name. Songoree, like everyone else on this part of the island, simply calls him Grandfather. Songoree busies himself with lighting a torch, which proves difficult in the damp breeze. Once lit, the red-yellow flames dance on the wind. It casts a shimmering light on Grandfather’s cape. The colorful feathers come alive. The effect makes Songoree stare wide-eyed, mesmerized. Songoree retrieves a carved gourd from the outrigger. It is adorned with feathers and shark’s teeth. The old man dons the helmet and, except for the two gaping eyeholes, it covers his head. A sharp beak is carved between the eyeholes, and set below that are two rows of shark’s teeth, upper and lower, making him look like a cross between a huge bird of prey and a menacing shark. Intricately carved lines on the mask emulate overlapping feathers covering the sharp angles of a shark’s facial structure. The lines are simple yet forceful, projecting an image of wild savagery. Only Grandfather’s long strands of silver hair and his bony legs extending below the cape show his humanity. Songoree steps closer to examine the mask. It suggests the outline of a primitive human face within its structure, as if the mask were meant to reveal the animal savagery within human nature, or perhaps man’s temperament within nature’s most fierce predators. Either way, he can’t quite dismiss the feeling that the mask is a projection of his own essence. “Quickly.” Grandfather grabs the torch. He hurries across the beach and on to the lava beds. They travel as swiftly as Grandfather’s legs will move. After a considerable distance, they stop where the barren rock fields skirt the rain forest. Honeycreeper finches and hooting pueho owls call from the tropical canopy. Grandfather takes the torch, nods towards the trees. Songoree dashes into the undergrowth. He returns a few minutes later carrying several palm fronds under one arm and a bundle of sticks under the other. Grandfather holds the torch low to the ground as Songoree arranges the palm leaves so the tips all touch at one point and fan out, creating a sizable circle atop a smooth spot on the lava rock. He makes two more trips to the forest to gather enough wood for the night’s ceremonial fire. He builds a pile of sticks in the center of the palm circle and steps away while Grandfather buries the torch in the pile. A flame catches hold. Grandfather passes both the torch and his staff to Songoree before stepping into the circle of palm fronds to kneel before the fire. Songoree drops the torch and enters the circle from the opposite side. With the staff held high, he echoes his grandfather’s words. He looks over his shoulder to insure that the bundle of firewood at the edge of the circle is within easy reach. It is his job to tend the fire throughout the ceremony. He watches the old man check the position of the moon, taste the air, listen to the breeze rustling the nearby palms. Everything is perfect, Songoree thinks. Why is he waiting? Grandfather pulls a sharkskin pouch from beneath his feathered cape. He opens it, grabs a handful of ground roots and sprinkles it on the fire. Blue sparks erupt from the flames while pungent smoke rushes on the wind toward the trees. “Let the herbs of this sacred land call the island gods,” Grandfather says. He draws several offerings from the pouch and lays them beside the fire—a flask of rice wine, polished seashells, sweet candies, a handful of rice, a folded leaf holding a purplish mound of poi. The firelight glows on Grandfather’s helmet. It shows the mask’s intricate carving and makes the old man’s eyes gleam red behind the two black eyeholes. Grandfather begins to slap the smooth lava beside him with his right hand, thumping the hard rock with a particular rhythm. He nods at Songoree. Songoree lifts the staff and brings it down on the rock, again and again, copying the same rhythm Grandfather makes with his hand. Once the proper beat is established, Grandfather stops, but Songoree continues to pound out the cadence. This thumping, he knows, is Grandfather’s notion of how to attract the island spirits. After twenty minutes, Grandfather signals him to stop then tilts his head towards the rain forest, straining to listen with every fiber of his being. Songoree studies the old man’s degree of concentration with awe. Grandfather signals for him to continue, and he takes up the thumping once again. The vibration of the staff makes a weird moaning noise when it strikes the ground. With every beat, he feels a vibration run up his arm and dissipate into his chest. Songoree doesn’t believe it, but he hears the eerie screech of a bird directly behind him. A shiver runs up his spine. It takes all his will power not to turn and look. He keeps his eyes focused on Grandfather. Grandfather lifts his arms over his helmet and begins to chant in an ancient dialect. His words come slow, relaxed, as if he’s singing a love song. His baritone voice is vibrant for one so old. Songoree feels the mystical pull of the words. He understands most but not all of the phrases. He still has much to learn of the old language and ceremonies. He understands enough to follow along as Grandfather recounts the history of the island people, countless generations migrating from the heart of Asia across the Pacific to these islands. The chanting continues for hours. As Grandfather sings, his long, delicate fingers weave through the air, as if they exquisitely form the words out of wind and mist. Songoree, mesmerized by their movement, finally looks at his own hand holding the staff. His are the hands of a twenty-year-old—strong, yet awkward by comparison. He wonders if he will ever command such grace. The thought makes him realize that he is real, not merely consciousness witnessing the ceremony from the mist. He shakes his head to drive the thoughts away. He reminds himself to focus. I can’t disappoint Grandfather, he thinks, not tonight. This means too much to him. Time bleeds by. The pile of firewood dwindles. Out over the eastern horizon, the stars fade before the growing light. As Grandfather chants, he pulls a bone-handled knife from beneath his cape and holds both hands over the fire—one held high, the other gripping the knife. The blade flashes in the firelight as Grandfather slides the razor edge across his left palm. Blood streams into the flames. Songoree hears a noise close behind him. It sounds like heavy claws scraping on rock. Whatever crouches behind him is drawn by the smell of blood. Fear overtakes him. He begins to beat the ground in a furious tempo. Grandfather signals him to slow down, but he feels an icy breath on the back of his neck. He drops the staff, and it clatters on the lava stone. Songoree can’t help but turn his head to see what’s breathing on his neck. As he does, an immense shadow lunges over his left shoulder. It lands thirty feet away on a boulder. Songoree’s body takes a tremendous jolt. He falls onto his back, shrieking. Frantically, Grandfather signals him to continue the thumping, but he can only stare in astonishment at the shadow. He is not altogether sure whether the shadow has leapt over him from behind or vaulted out of his body. His body certainly felt something leap. He stares intently with eyes wide open and sees a blackness that doesn’t have any visible boundaries; but slowly, a silhouette crouching on the rock begins to emerge from the mass that is superimposed on the night sky. It seems to be taking the form of a big cat—huge, awesomely silent. The density of the shadow’s darkness pales the night sky around it. Grandfather slaps the ground with his hand again, pounding out the same rhythm as before. Songoree manages to fight through his fear. He scrambles back to a sitting position, picks up the staff and resumes thumping the cadence. Grandfather begins to chant once again. As his voice rises in volume, Songoree joins in. root, rock, sand, and light, is he. holds the sun by day. Kane is never still, all is moving. All is fluid, ever changing. It is the time of the Speaker. Complete are land, water, and heavens. Complete are bird, fish, and beast. Now comes the time of man. Their voices hush. The wind dies to a whisper. The dense shadow dissipates, leaving no trace. Songoree wonders whether he actually saw anything there at all, or did fear create something from his imagination? He glares across the fire at Grandfather, silently pleading for help to understand what has happened. All he can see are eyes within the mask’s gaping holes reflecting the red-yellow firelight. Everything is perfectly still, as if the entire universe is holding its breath. A bird calls from the nearby trees. In the distance, the sound of the surf rises in a steady pulse, like the slow beating of a heart. A breath of wind flutters the nearby palms. Songoree feels the growing breeze on his skin. Now the wind travels in a different direction, from the rain forest out over the sea. He smells the sweet odor of jungle frangipani mixed with the slight stench of rotting vegetation. Grandfather struggles to stand. Songoree hurries across the circle to help him to his feet. He hands the staff back to Grandfather. He pulls the red tapa cloth from his waist, rips away a long strip and wraps it around the old man’s bleeding hand. Naked and exhausted, he loops one arm around his grandfather, supporting the old man’s weight. They turn back toward the beach. They stagger back to the canoe as the red dawn paints their beloved island with sanguine light.